The Indigenous Choreographers at Riverside (ICR) Gathering brings Indigenous dance artists, Indigenous studies scholars, and dance studies scholars to campus to connect, discuss, and share work. We gather on the current and ancestral land of the Cahuilla, Tongva, Serrano, Luiseño (Payómkawichum), Cupeño and Kumeyaay Peoples, where the University of California, Riverside is located to look at ways Indigenous dance, in many diverse forms and locations, engages Indigenous knowledges, and at the import of these articulations. Our highlighted guest artist this year is Grupo Sotz’il, who are in residence at UCR from April 27 through May 7. Grupo Sotz’il is an eight-member ensemble of young Kaqchikel and Mam multidisciplinary artists dedicated to researching, creating and promoting Mayan knowledge and arts. Founded in El Tablón, Sololá, Guatemala in the year 2000 by the Tat Lisandro Guarcax (1978–2010), Grupo Sotz’il’s art reflects the present and envisions the future, with firm roots in the wisdom and knowledge of their ancestors. Additional dance artists participating in this year’s gathering include: Lukas Avendaño (Tehuantepec, Oaxaca, México); Louise Potiki Bryant (Aotearoa/New Zealand); Jack Gray (Aotearoa/New Zealand and NYU); Grupo Sotz’il (Kaqchikel Maya, Guatemala); Sam Mitchell (USA); Rulan Tangen (DANCING EARTH Indigenous Contemporary Dance Creations; based in Ogaa Po’ogeh, Tewa territory known as Santa Fe, NM & Yelamu, Ohlone territory known as San Francisco, CA); Ni’Ja Whitson (USA) and Traditional Cahuilla Bird Singers. Grupo Sotz’il’s participation in this year’s ICR is an enactment of the group’s desire to re-activate the long-standing connection between Indigenous peoples of the four directions, a multivalent circuit of exchange that predates the colonial imposition of borders. This commitment to transnational Indigenous solidarity has taken Grupo Sotz’il to almost every continent, where they have engaged in reciprocal sharing of knowledge and story. Selected by the New England Foundation for the Arts’ prestigious National Dance Project Touring Award, this is Grupo Sotz’il’s first time participating in the ICR. With the opportunity afforded by the ICR to dialogue–through words and movement–with artists and scholars from throughout Abya Yala/Turtle Island, Grupo Sotz’il looks forward to new connections toward future collaborations and forms of solidarity. Followed by Dialogue on Process with UCR faculty, including Michelle Raheja, Maria Firmino-Castillo, Jose Reynoso and Jacqueline Shea Murphy, and with artists Louise Potiki Bryant and Grupo Sotz’il dance and music ensemble members. Free and open to the campus with RSVP. Please RSVP HERE. Featuring an excerpt from Uk’u’x Ulew by Grupo Sotz’il, with dance offerings from Traditional Cahuilla Birdsingers and Dancers, Lukas Avendaño, Louise Potiki Bryant, Jack Gray/si dåkot-ta alcantara-camacho/Toni Pasion/Bianca Hyslop, Rulan Tangen, Ni’Ja Whitson, Sam Mitchell, and a welcome from Gerald Clarke. An international, interdisciplinary, gathering of scholars and dance-makers writing about Indigenous dance. Invited contributing writers will offer brief key points from their recent work, followed by open time to identity and discuss emergent ideas. The day will begin with short presentations from those contributing to an anthology, who have circulated first drafts of potential pieces to one another. Responses from one another and UCR faculty, and discussion around overlapping and emerging ideas will follow. 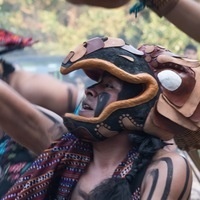 Uk’u’x Ulew is a multisensorial Maya dance-ritual. Its interactive choreography provokes embodied reflection on the environmental/political/spiritual dimensions of our planetary crisis—stressing human complicity while restoring reciprocity with our ecological matrix, or Uk’u’x Ulew. A multidisciplinary dance work performed with live music, Uk’u’x Ulew was created collectively by Grupo Sotz’il’s eight Kaqchikel and Mam Maya dancer-musicians and dramaturg. In this 60-minute performance of xajoj q’ojom (music/dance), fire, water, earth, and air interact in harmony and conflict. From their collusion and collision, K’aslemal, life, is born. The exuberance reaches beyond the borders of the performance space, but Tz’i’—the hound that embodies the word—signals danger. Critical Scholarship in Indigenous Dance Writers’ Workshop II, continued.